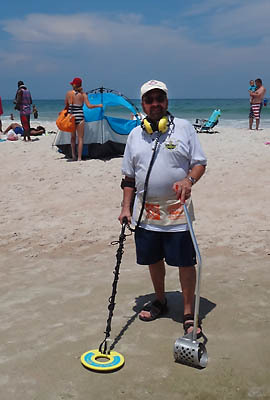 Metal Detecting, Jul '15, Sun Splash Park, Daytona Beach, FL. Saturday - July 27, 2015. Metal Detecting Outing - This summer has been a wet one so far but that pretty much means a bit cooler also. 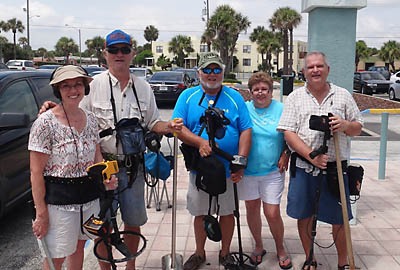 Our metal detecting outing at Sun Splash Park in Daytona fit that description perfectly. Members were worried about a possible rain postponement as every day for the week prior had torrential downpours, in some places lasting all day long. But the East Coast beaches are in a league of their own. There’s not as many days where it rains as it does inland, and on our outing it wasn’t any different. As members began arriving in the morning the day was overcast and cool. Throughout our morning session on the beach it remained that way, with a slight breeze keeping everyone in good spirits. The morning finds there were typical beach finds. Coins, junk and a few cheap pieces of jewelry made up most of them. Carol led the group in total coins found, but Bob edged her out in overall value. Bob created a small detecting patch near the seawall that contained about 25 tokens and items. Most of these were found by the members. Marty and Warren led the group and Warren found the ring that was planted there. 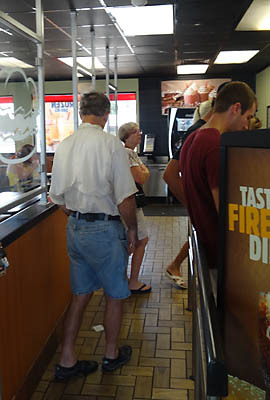 Around noon we headed off to Burger King for lunch. By 1:30, after a good fill, Eddie was ready to head out again. Bob stated it’ll be better to just sit here and relax until maybe 3pm. The clouds were now gone and the summer Florida sun was set to "BAKE". Eddie, Cathy and Susie headed out for a second round at Frank Rendon Park. The rest of us followed in about 20 minutes. This time around the Sun quickly took its effect as within 45 minutes everyone was drained of energy enough to call it quits and head home. So much for the cool morning, but at least we enjoyed a day without rain. Carol, Marty, Eddie, Cathy and Bob. Warren ready to head out.